In reading about the holiday practises of the Elizabethans, one frequently comes across the term “mumming and disguising.” I had no idea what that meant until I read a very important book by a group of anthropologists who, back in the late 1960s, traveled to Newfoundland to examine the holiday practises of the fishermen who live along the weatherbeaten northeastern shores of the Atlantic. 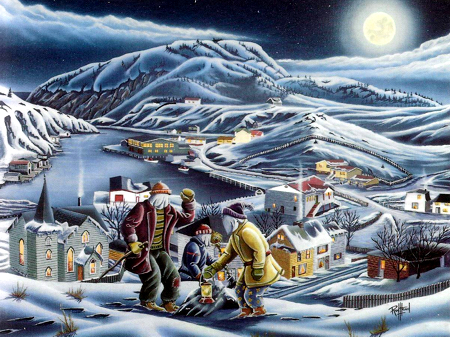 Christmas Mumming in Newfoundland describes the, to us, bizarre ways in which these folks celebrated their holidays. The report is dry reading for anyone looking for human interest. It’s like photos, not just in black and white, but in infra red. But somehow that makes the story even more interesting. These descendants of English and Irish fishermen who, after centuries of fishing off these shores had finally established permanent colonies in the 16th century, and who were still largely cut off from a changing world by wild ocean and rugged, undeveloped land, were just beginning to open to the outside world in ways that would soon be eradicating their ancient traditions. At the time of the anthropologist’s visit, a paved road had just been built connecting them for the first time with St. John’s by land. A television connection was about to be made. It seems this was the final moment for the kind of investigation undertaken by the scientists. Recent illustration by a Newfoundland artist. Long story short: mumming is what anthropologists call the “house visit,” that is: going from house to house in disguise with a group of other mummers, as on Halloween, while disguising means costuming so thoroughly that one’s identity is hidden, a practice similar to Carnival, except that Carnival costumes as we know them don’t necessarily obliterate the wearer’s identity. There are also traces of the Christmas tradition of going from door to door in groups singing carols and collecting money for the Church. These represent the vestigial remains of what we can guess was once a universal winter solstice ritual practiced during the Stone Age. These isolated communities, consisting solely of fishermen and their families, lived much as they had since their ancestors first came over from England and Ireland. They had plastic buckets, no doubt, and the latest foul weather gear, but without television or roads, they lived very simply. They spent no money on their costumes, but simply did as their ancestors had done, disguising themselves with whatever was at hand, mostly each other’s clothing, plus pillows, bedspreads, mops, paper bags, gloves and boots, often worn on opposite feet. The goal was to render oneself, not something romantic, as in the Venetian Carnival, but something unrecognizable. As long as a mummer could not be recognized by the neighbors, the game was on. A party of mummers would gather in someone house, gear up, and set off for whatever house was closest that they hoped would let them in. Once in, the group would entertain their uncomfortable hosts by singing, telling naughty stories and dancing, each member doing some routine, speaking and singing in a peculiar but traditional manner that was meant to disguise their voices. As soon as the hosts recognized one of them, off would come the mask and the gloves and the monster would metamorphose back into a relative or neighbor. As soon as everyone’s identity was guessed, on went the disguises again and they were off to the next house. This was through piles of snow, of course, so far north, so they were bundled up against the cold as well. Needless to say, a fair amount of alcohol was consumed along the way, along with homemade holidays treats, the “cakes and ale” of Shakespeare’s Twelfth Night, itself a window into the attempts of a sixteenth-century household to celebrate the season in the old way, tormenting the puritanical steward, also in the old way. That men often dressed as women and vice versa probably says something about the emotional satisfactions of the tradition as a factor apart from the need for total disguise. It may also suggest that the gender-bending in Shakespeare’s holiday plays have a broader basis in tradition than modern critics, fond of ascribing it to some factor in Shakespeare’s libido, are willing to acknowledge. These people could not go fishing for two or three months during the winter while the harbors were frozen, so the community occupied itself with repairs to gear and otherwise eating, drinking, and making merry in the same ways that their fathers’ fathers’ fathers and mothers had done. At some of these get-togethers they might put on a version of the old mummer’s play, but as this folk play, a sort of plum pudding of themes and heroics from ages past, all lumped together into one utterly plotless (but probably hilarious) entertainment, has been described elsewhere I will not describe it. It is great-great-grandparent of the Christmas pantomime, thankfully still joyously alive and well in Britain between Christmas and New Years. The anthropologists said that it was very difficult to get the people to talk about their holiday practises. They were shy about talking to strangers about anything, and particularly shy about this tradition. The scientists got the feeling that they weren’t being told everything. This for at least two reasons. First, such holiday practises were dangerous. Shameful things could happen during this rural saturnalia when normal social constraints were relaxed and everything was turned upside down. It was not only a time of making merry, it was potentially a time of reprisal, of setting things straight, of settling old scores. There was a lot of drinking. Things could get rough. Second, these people were afraid of strangers. With no outside access to the community other than by water, they didn’t see too many people they didn’t already know; when they did it could mean trouble. The Devil was seen as a stranger. In fact, the word stranger itself had a dangerous connotation. As strangers who would leave after a certain time, the anthropologists were seen as potentially dangerous. Why were they asking these questions? But beyond these reasons lay centuries of silence on the subject of year-end rituals, a silence that may have emanated from the original ritual itself, a sacred event about which it was forbidden to speak, or in the face of the disapproval of the Church, as it came in and eradicated or civilized the ancient rituals of the oldest faith, the one that hears sermons in stones and books in running brooks. Several things came clear from this that were not discussed by any of the researchers. First, it is clear to me that for people who lived so close to each other year in-year out, whose families all knew each other intimately and knew everything there was to know about each other’s histories, some of it no doubt shameful or embarrassing, they needed a break from being themselves. They desperately needed a few hours of socializing as strangers, without the burden of their ordinary identities. This is not something that would be immediately understood today. If anything, people today, city-dwellers in particular, tend to suffer from the opposite problem, from feeling too unknown, too anonymous. Today, if we should feel the need to shuffle off our identities for a time, we can go downtown, or to the mall, or take a drive to another town or city. If we live in the country, we can go to the city, or we can fly off to some distant beach resort. But for people living in small, isolated, unchanging communities for their entire lives, disguising may have been a psychological necessity. As I read the book I could see in the ritual as it was recorded in Newfoundland in 1967 a reflection of those rituals enacted at Queen Elizabeth’s Court during the winter holidays, on May Day, and at weddings. The Court version of mumming and disguising was the masque, in which the entire Court dressed to an agreed-upon theme. There would be a show, similar to a present day musical, with a very light plot and a lot of singing and dancing led by those servants of the Court who excelled during which all members of the Court were expected to join to some extent, including a feast where quantities of sweets and wassail were consumed. Unlike the simple fishermen of Newfoundland, it was not possible for the members of the Court to get a total break from their burdensome identities. To have allowed total disguise would have been dangerous, giving access to those who meant harm (witness the story of Sir Gawain and the Green Knight). Instead they had their break as a community, the entire Court costumed as members of a romantic community of one kind or another: shepherds and nymphs, mermaids and sailors, medieval knights and their ladies. Vestiges of this remain in modern weddings where the bridesmaids and groom’s men all dress alike. Shakespeare is filled with disguisings. His use of them for wicked or destructive ends is shown by the coup in Thomas of Woodstock (aka Richard II Part One), in which young King Richard and his cronies pretend to be actors, only to kidnap and later assassinate Richard’s uncle, the Duke of Gloucester while performing for him. It is also shown in The Spanish Tragedy, in which the tragic final act is a play within a play wherein the leading actor in an amateur performance takes advantage of the plot to kill those he holds responsible for murdering his son. Shakespeare had two kinds of plays at the beginning: the one, modelled after Greek and Latin writers, both comic and serious, meant to entertain the gentlemen of the Inns of Court, and the other, wedding or holiday comedies for the Court community that drew more heavily on folk traditions. These two communities often overlapped, but the Inns of Court community was more masculine, more highly educated and far more democratic than the Court community. Even the poorest law student at one of the Chancery Inns could muster up the price of an evening at Blackfriar’s once a term. Love’s Labor’s Lost, Twelfth Night, and As You Like It were written originally as Court holiday plays; A Midsummer Night’s Dream and The Tempest were wedding plays. (Roger Stritmatter holds that The Tempest was a Shrovetide play, which it may have been for the particular moment he has in mind, but it was certainly also the play given at Oxford’s daughter’s wedding in 1595.) Some, like Taming of the Shrew and Merry Wives of Windsor probably began as wedding plays that turned into something else with subsequent revision. In any case, Shakespeare saw the stage as a way of using language much like the old Revels used music and dance. The wit, the conceits, the jesting duels, the comedy routines, the happy finale when all disguises come off, Jack has found Jill, upside-down is right-side-up again, and all offenses are forgiven. All these were gradually included within the framework of the play itself, so that what had been a loosely organized series of small events, often spread out over hours or even days in several locations, was gradually pulled into a single event with many scenes within it, some funny, some scary, some sad, but all tied into a plot that had a beginning, a middle and an end. Shakespeare repeats this in two of his plays, Hamlet and Love’s Labour’s Lost. The hobby horse was a feature in the old mummer’s processions. A man dressed in a horse costume, his identity hidden, would dash at the crowd, singling out individuals whom he thought deserved a public reprimand, while the crowd roared in a combined shout of approval and alarm. By eliminating this generally harmless and frequently effective means of shaming offenders, by which public harmony was maintained at no cost to anyone, the Reformation forced people to take their issues with neighbors to court, an expensive, time-consuming, and frequently useless process where the offenders had the money or prestige to avoid judgement. Either that or take a far more deadly revenge into their own hands. Wasn’t Oxford himself something of a hobby horse, one who went into action every winter with plays for the Court holiday, plays that satirized Court figures, and who, when confronted with the need for a name so he could get his poetry and plays published, disguised himself as one of his friends, secretaries, copyholders and finally, as the illiterate William of Stratford? Stephanie – I love this blog. Thank you. I am reminded of the holiday ‘Pantomime’ that we all looked forward to as children in England and is still a tradition. Aimed at the working class it is entertainment with a morality tale in the form of musical comedy . In it the hero is a woman playing usually playing the part of a prince and the antagonist is an elderly man usually playing the part of a fair maid’s mother. Genders and identities are always up for grabs and part of the fun. When you mention the preservation of the tradition of mumming by English immigrates to Newfoundland I am also reminded of a section in the series of ‘The Story of English’ . In it there is a description of people living on the Tangerine islands off the east US coast called Tangerines! Apparently these people left England in the early 1600’s and have lived on the island since, relatively undisturbed. Their accent and language has, as a result of their isolation been preserved as essentially Elizabethan. According to the book when these emigrants left England there were not as many variations in accents then as there are now. Their inflection, phrasing and grammer- a vaguely west country accent is barely understandable as English but quite musical. Thanks, Lynda. It would be great if we could put a clip of this segment on the blog. I wonder how exactly this relates to the Philadelphia Mummer tradition…it’s much more Carnival like, with burly men dressed in feathered and sequined costumes, playing “Oh Dem Golden Slippers” on ukeleles while strutting down the street in competing clubs on New Years Day. Check it out! It’s a bizarre, and due to lack of city support, possibly dying tradition. The British mumming tradition involves the performance of folk plays. Yes indeed. Such a play might well have been seen by Oxford at Christmas during his childhood in the upper Thames valley, one basis for a later enthusiasm for creating holiday entertainments. The link you provide gives a good breakdown of mumming traditions, though somewhat marred by the constant repetition of “not proven.” What kind of proof is needed to see the obvious connections between these long ongoing traditions, some lasting even to this day in trick-or-treating and carolling? Perhaps the most interesting thing about the mummer’s play is the theme of resurrection, to me clearly an element left over from a Stone Age solstice ritual. What form it took originally we can only guess at. In the mid-16th century, the Reformation having condemned mumming and disguising, Shakespeare arises from its ashes (like the Phoenix) with something else for people to do at Christmas, something in which it is only the professionals who do the mumming and disguising.